If you would like details of the music, please sign up to our newsletter. Cantabile is a friendly SATB chamber choir specializing in performing the finest church music from the Renaissance to the present day. Regularly invited to sing Choral Evensongs, concerts and special services in the many fine churches in Jersey (10 have been visited during the past year), we have also sung in English cathedrals (most recently in Leicester, July 2018) and in Coutances Cathedral and churches in Normandy (in September 2017). The choir also occasionally sings at weddings and memorial services and for corporate and private events. Our musical director, Graham Caldbeck, is one of the UK’s leading conductors of amateur choirs and brings a wealth of practical experience as a singer, conductor and teacher to our rehearsals. The choir meets on a Tuesday evening in St. Martin’s Parish Church between 7.30pm and 9.00pm. You are most welcome to attend a rehearsal on a trial basis and to sample the opportunity to improve your vocal and musical skills in a thoroughly enjoyable way. 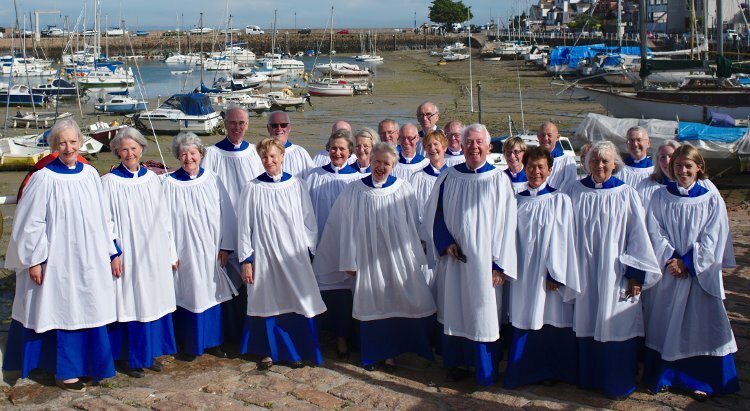 Between September 2017 and July 2018, the choir has sung on 22 occasions in 14 different venues in Jersey and France, encompassing choral evensongs, an Advent service, a Nine Lessons & Carols service, carol singing at Hamptonne and at Government House for the Lieutenant-Governors’ Christmas Reception; a Passiontide service, a Latin Mass, a choral Eucharist and at the special service marking the new Dean’s Induction. Last year we also sang at the services marking the retiring Dean’s farewell and welcoming the new Lieutenant Governor. In May 2018, the choir sang for the Mass for Pentecost at St. Thomas’s, one of the last big Festival services taken by the retiring Catholic Dean, Monsignor Nicholas France. The choir has sung there for three years in succession. Over the past year the choir has performed a wide range of music from six centuries – some 80+ works by 50 composers - including works by Taverner, Tallis, Lassus, Victoria, Hassler, Eccard, Byrd, Gibbons, Bach, Mozart, S.S. Wesley, Stainer, Stanford, Wood, Brewer, Vaughan Williams, & Middleton. More recently-composed works have also featured prominently in the choir’s attractive and eclectic programmes, including works by Villette, Howells, Sumsion, John Joubert, Leighton, John Rutter, Philip Wilby, Graham Caldbeck, Howard Skempton, Howard Goodall, Bob Chilcott, James MacMillan, James Whitbourn, Rihards Dubra and Ola Gjeilo. If you would like to receive the choir’s newsletter please sign up using the nearby link on this page, and if you are interested in joining us or booking us, please contact our Chairman Fred Benest on 863826. Graham is also Director of Music at St Clement's Church. Graham Caldbeck is one of Britain's leading conductors of amateur choirs. He studied music at Trinity College, Cambridge, where he was a Choral Scholar, and has sung with the Cathedral Choirs of Guildford and Winchester. He holds both the Fellowship and Choir Training diplomas of the Royal College of Organists, is a former Assistant Organist at St. Martin-in-the-Fields and Director of Music at St Mary The Boltons in Chelsea. After initially working in schools in Cheshire and London, he headed the Hampshire Specialist Music Course before moving to the Royal College of Music. There he was Head of Undergraduate Studies and subsequently Head of Individual Studies between 1989-2004, and also conducted the RCM Chorus and Chamber Choir. For five years he was an External Examiner at the Guildhall School of Music & Drama. 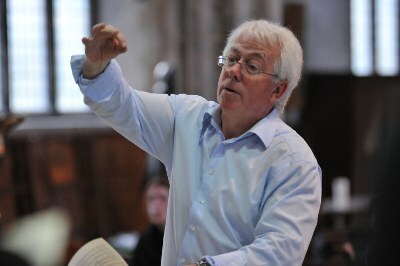 Graham was founder-conductor of the Winchester-based chamber choir Southern Voices in 1984 and directed it until 1999, appearing in the Southern Cathedrals’ Festival and also preparing concerts and recordings conducted by Richard Hickox (winning a Grammy for their 1993 Delius recording) and David Hill. Graham conducted the Somerset Chamber Choir between 1990-2017, working with many of the UK's most talented instrumentalists and soloists. Between 1996-2012 he conducted the Nonsuch Singers, a well-known central London chamber choir, and directed the Mayfield Festival Choir in East Sussex between 2005-2012. He is now conductor of the recently-founded chamber choir, Somerset Voices. His concerts have regularly been highlighted in the national press and broadcast on TV and radio, both in the UK and the USA, and he has worked with many of the UK's leading composers. He has conducted choirs for services in many UK cathedrals, including St. Paul's, Winchester, Salisbury, Wells, Truro, Hereford, Worcester, Brecon, Leicester, Ripon and York Minster. Graham now pursues a freelance career as conductor, organist, vocal coach and teacher. In 1992, 1994 and 1996, he conducted the Jersey Festival Choir as guest conductor with an RCM Orchestra. He moved to Jersey in September 2012 and is now also Director of Music at St Clement's Church. 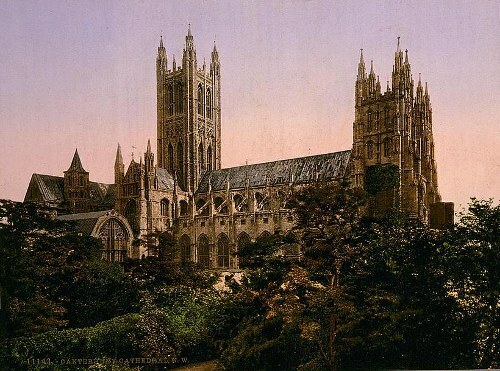 From the earliest days of the Church of England until the 1960s Sunday worship consisted mainly of Morning Prayer (or Mattins) and Evening Prayer (or Evensong). Holy Communion was only celebrated three or four times a year (which explains why you will find it somewhere in the middle of the Book of Common Prayer and not at the beginning). It was the Parish and People Movement (later to become the Parish Communion Movement), formed in 1949, that began the shift away from Mattins and Evensong towards weekly communion. Copyright ©2009-2019 Cantabile Jersey, All rights reserved.